The late Laurance Darwin Sawyer just wanted to build a better birdhouse. And he did. Sawyer built birdhouses by the dozens. He built them with curb appeal and rustic style, and bluebirds, goldfinches, sparrow, wrens and more flocked to occupy them. Sawyer died in 1994, but family members - his widow, 94-year-old Adelaide Sawyer, and their children and grandchildren - have continued his work. "My brother Marvin took it over after Daddy died, but then Marvin died in 2000," said Laurance Sawyer's daughter, Elaine Sawyer Whittemore. She and her husband, Edward, stepped in to help her mother continue the business. "Our objective has been to keep it going," she said. 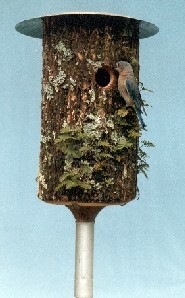 Bluebird Housing, custom-made log bird houses, feeders and suet feeders, is headquartered in a shed outside the home Edward and Elaine Sawyer Whittemore share with her mother. Though the company name is Bluebird, the family manufactures houses for many types of songbirds, owls, ducks, woodpeckers and others. "We cover every little bird except the hummingbird," Elaine Whittemore said. The primary raw material is logs. A fallen tree in the forest can be a prize, and friends and family members keep their eyes open for them. Elaine even selects choice small branches to serve as feeder perches. Poplar is popular with their customers, but cypress, sycamore, white birch and ponderosa pine are other types of wood they use. Some wood, such as walnut, is sanded and varnished, but most often they leave the bark on, sometimes still with the lichens, mosses and ferns the tree hosted. "At one time my father had 30 orders for houses with resurrection fern," Whittemore said. "It took us years to fill them, but eventually we found enough resurrection fern, and most of the people who had ordered a long time before still wanted them." To keep the nest safe from predators, a bird house entry hole is precisely the size to accommodate the adult bird. The house wren, for example, wants a hole 1 1/4-inches in diameter; the slightly larger bluebird wants 1 1/2 inches; the tree swallow 1 3/8 inches. The log sections lie in rows on shelves, each one hand-labeled on the bottom with its own number, the date and its size - a custom-made work of art. Nearby, bins hold metal roofs and trays. "The galvanized metal tops are made for us in Chattanooga; the feeder trays and lids are recycled container lids that we paint, and then we drill drain holes in them," Whittemore said. The tops of the houses can be removed for viewing or photographing the babies in the nest. Each bird house fits onto a pole, which attaches to a recessed, flat, wooden plug that has ventilation grooves and drain holes. For the feeders, the plug has a cone-shaped top, which forces the seed to lie near the outside perimeter to make it more easily accessible to the small birds. 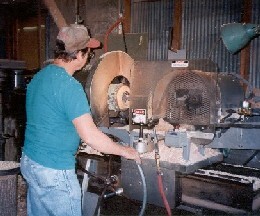 The heart of the production process is the woodpecker lathe, the third one the company has built. Laurance Sawyer invented the original one and later built a second version, and named it for the bird that also hollows logs for habitat. Sa wyer's late son, Marvin, designed the woodpecker lathe that's in use today, installing improvements to ease and speed production. 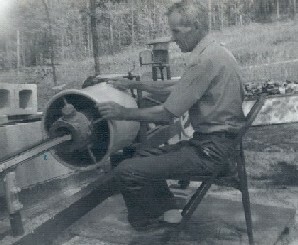 Marvin Sawyer also built a pipe-cutting machine and mechanical punches to punch and flare the tops of the metal posts that attach to the houses and feeders. The houses sell for $40 and feeders from $45-$60. Poles and predator guards are $10 and masks are $5. The mask is a metal guard for the birdhouse entry hole to prevent squirrels from chewing their way in. Adelaide Sawyer keeps up a file of 8,000 names of commercial and individual customers who have purchased from the business over the years since it began in 1974. But the story of this family's love for songbirds really began much earlier, with Laurance Sawyer's father, Edmund Joseph Sawyer. E.J. 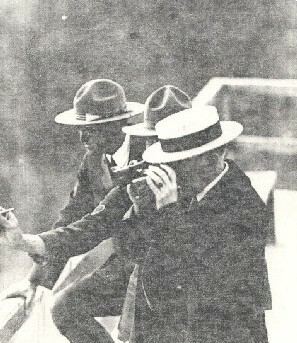 Sawyer was park naturalist at Yellowstone National Park and later field ornithologist for New York state and widely known for his precise paintings of large and small birds in their habitat. E.J. Sawyer was born in 1880. Orphaned at an early age, he dropped out of school after a teacher ridiculed a paper he turned in. Told to list all the birds he knew and to tell about them, he turned in only one bird: the robin. What the teacher failed to notice was an accompanying extensive list of his personal observations of the robin, its nest, eggs, habitat and lifestyle. "This bird was only one of a possible 60 that he could have thus described, but time ran out," Laurance Sawyer wrote in an essay about his father. Sawyer wrote that his father told him, "I left school that day and never went back." Elaine Whittemore proudly displays a photograph of her grandfather wearing the uniform of a park ranger and pointing out some of Yellowstone's ospreys to President Calvin Coolidge. Whittemore has many of her grandfather's bird paintings framed and hanging in her home. About a dozen of his works were used on the covers of the Audubon Society's educational materials. E.J. Sawyer died in 1971 at his home on Vashon Island in Puget Sound, Wash., which he had chosen as a bird haven. He had published booklets of plans for bird houses constructed from boards, with precise, hand-drawn illustrations. But he illustrated one book with what he thought was the best man-made bird house of all: a hollow log. Growing up, Laurance Sawyer was a willing student of his father's vast knowledge and developed his own lifelong interest in birds. But it wasn't until he was 63 that he retired from a regular job and turned to building bird houses. Laurance Sawyer had in mind a machine that would hollow out the logs. His first effort was a 5-inch saw blade rigged to a washing machine motor. "It took half an hour to saw out the middle and I nearly burned the motor up," he told a Chattanooga news reporter. But it served as a prototype for the first woodpecker lathe. And that was the beginning of Bluebird Housing. "My daddy grew up in the woods and was always interested in birds, so I grew up outdoors, always tapping on a hole to see what came out," said Elaine Whittemore. "My son and daughter-in-law live next door and help out with the houses, and nieces and nephews, too - just anybody who's got a free hand. It's just in our family."